Mount your Garmin nuvi, camper, dezl, drive, driveassist, driveluxe, drivesmart, drivetrack or zumo sat nav on top of your vehicles dashboard instead of your car, trucks or motorhomes windscreen. 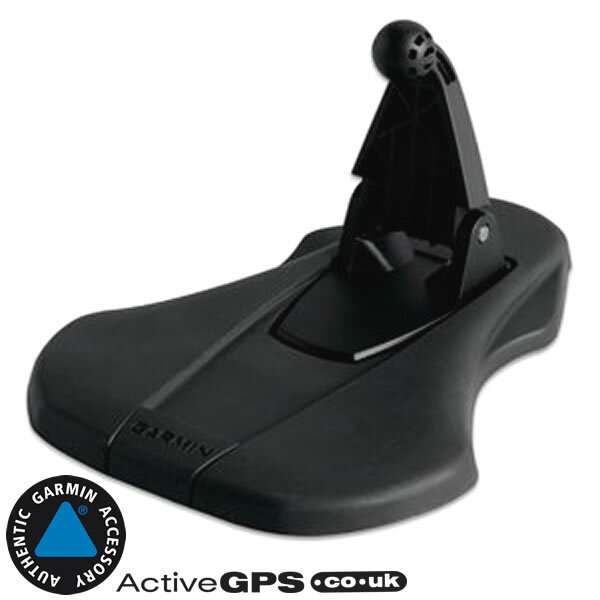 The weighted mount with non-skid base moulds to your vehicles dashboard ensuring your Garmin sat nav is held securely in place. Please note: Your sat nav's mount cradle (which was supplied with your original sat nav purchase) is also required to complete the installation and clicks into place on the portable friction mounts ball joint on the end of arm (see photos). Compatibility: Compatible with Garmin nuvi, nuLink, Camper, dezl, Drive, DriveAssist, DriveLuxe, DriveSmart, DriveTrack, zumo. 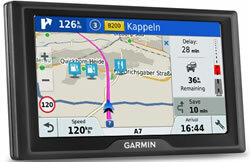 View a full compatibility list of Garmin products. 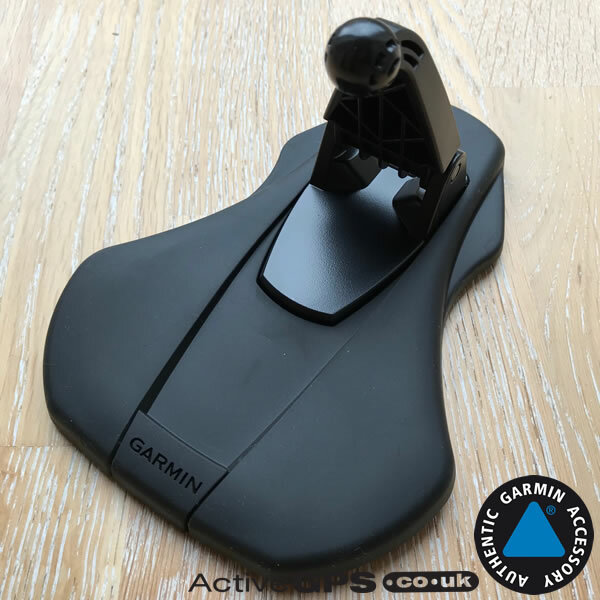 Mount your automotive Garmin nuvi (car), dezl (truck), camper (motorhome) or zumo (motorcycle) sat nav in your car, van, motorhome or truck the easiest possible way by buying the Garmin portable friction mount from ActiveGPS. 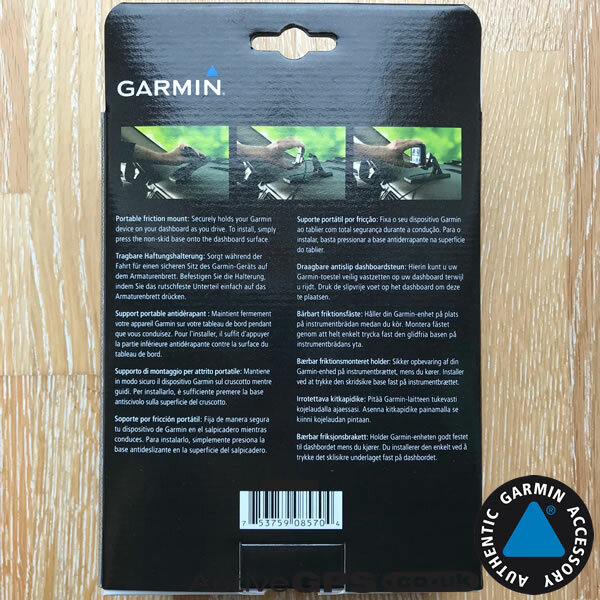 This genuine Garmin accessory is designed to be simply placed in position on your vehicles dash top and stay there thanks to its anti-slip and weighted base. It's also very flexible so it will mould to the contours of your vehicles dashboard. No more marks on the windscreen or your sat nav falling off, the portable friction stays exactly where you place it. What's more, unlike suction cup mounts, it doesn't leave any marks, plus by simply lifting the complete portable friction mount and your sat nav still attached, it can be removed out of sight or transferred to another vehicle in seconds. Please note: No cradle is included. 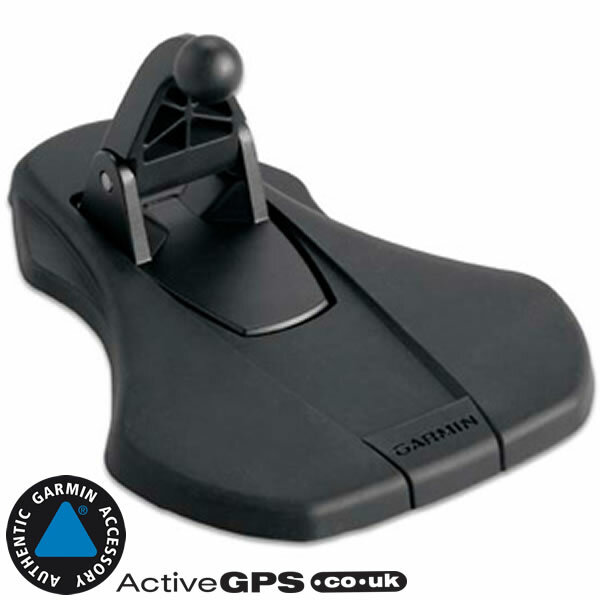 The Garmin portable friction mount is a universal part; to use with a particular Garmin nuvi, camper, dezl or zumo sat nav requires you to use your original cradle/unit holder. Your Garmin's cradle or unit holder then attaches to the portable friction mounts ball joint connector to complete the installation. Lost or can't find your cradle? 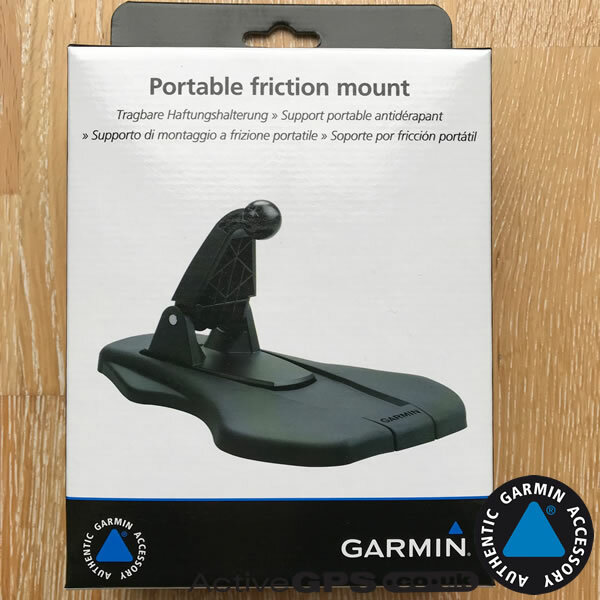 You will usually need to buy the appropriate complete suction cup mount for your Garmin satnav which you can then use with this portable friction mount. Please note: Your sat navs mount cradle (often supplied with the original purchase) is also required to complete the installation and clicks into place on the portable friction mounts ball joint. Unsure? Want further advice? Contact us here. ‣Portable mount with fold up arm and ball joint connection. What is the portable friction mount compatible with? Garmin Aera 500, 550, Camper 660, 760, 770, 780, dezl 560, 570, 580, 760, 770, 780, dezlCam, dezlCam 785, Drive 40, 50, 51, 61, DriveAssist 50, 51, DriveLuxe 50, 51, DriveSmart 50, 51, 55, 60, 61, 65, 70, DriveTrack 70, 71, fleet 590, GPSMAP 276Cx, nuvi 20, 30, 40, 50, 200, 300, 400, 500, 600, 700, 800, 1100, 1200, 1300, 1400, 1600, 2200, 2300, 2400, 2500, 2600, 2700, 3400, 3500, 3700 series (all model variations e.g. nuvi 765T, nuvi 255WT, nuvi 2445LMT etc), nuviCam, nuLink 1695, 2340, 2390, zumo 200, 300, 400, 500, 600 series (all models). Please note: The Garmin DriveAssist 50 and DriveAssist 51 both feature a built-in dash cam. The dash camera will NOT work when using with the portable friction mount. This is because the portable friction mount arm blocks the view of the camera. The DriveAssist 50/51 can still be used as a satnav with this mounting option.